In her boldest and most darkly humorous novel yet, award-winning, critically acclaimed and bestselling novelist Louise Erdrich tells the intimate and powerful stories of five Great Plains women whose lives are connected through one man. Stranded in a North Dakota blizzard, Jack Mauser's former wives huddle for warmth and pass the endless night by remembering the stories of how each came to love, marry and ultimately move beyond Jack. At times painful, at times heartbreaking and often times comic, their tales become the adhesive that holds them together in their love for Jack and in their lives as women. Erdrich, with her characteristic powers of observation and luminescent prose, brings these women's unforgettable stories to life with astonishing candor and warmth. 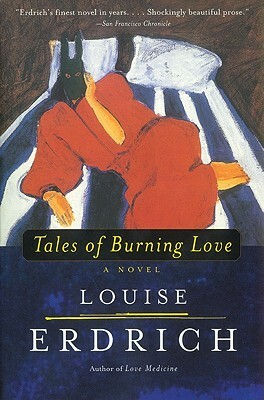 Filled with keen perceptions about the apparatus for survival, the force of passion and the necessity of hope, Tales of Burning Love is a tour de force from one of the most formidable American writers at work today.